The Hofburg in Vienna, the central government building of the Habsburgs. The Hofburg is a large building in the centre of Vienna. It was the central government building of the Habsburgs during the Austrian monarchy. All four emperors of Austria had their residence in the Hofburg. Since the Second World War, the Hofburg has also been the official residence of the Federal President of the Republic of Austria. 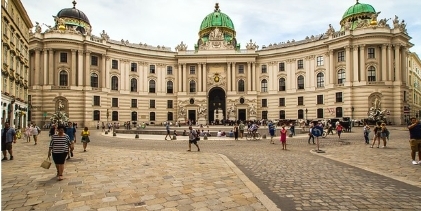 Since the President of Austria, currently in 2018 Alexander Van der Bellen, does not need quite as much space as the emperors in the 19th century, many parts of the Hofburg are now open to the public. 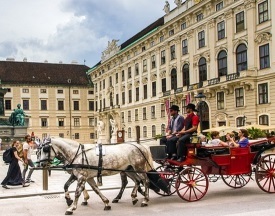 The Hofburg is home to the Spanish Riding School with the famous white Lipizzaner horses, which actually come from Lipica in Slovenia. Also a top sight in the Hofburg in the National Library of Austria with the famous State Hall (Hofbibliothek). There are also some great museums. The treasure chamber with many objects from the imperial period and older epochs is very popular among the tourists. The Imperial Apartments, the Museum of the world-famous Empress Sisi (Empress Elisabeth of Austria-Hungary) and the Silver Collection are further museums that can be visited. Of course, all these sights cost admission. There are single tickets and combination tickets. Admission to the Augustinian Church is free.